McCormick Grill Mates® Mesquite Seasoning has flavor you can see! 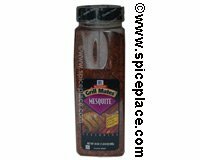 Mesquite Sesaoning is simple to use: Simply shake 1 tbsp of Grill Mates Mesquite Seasoning per 1 pound of chicken, ribs or pork before grilling or broiling. Ingredients: Spices, Salt, Garlic, Onion, Red Bell Peppers, Sugar, Paprika, Partially Hydrogenated Soybean Oil, Citric Acid, Grill Flavor (From Partially Hydrogenated Soybean and Cottonseed Oil), Natural Flavor, Natural Mesquite Smoke Flavor and Sulfiting Agents. Mix Lime Juice, Seasoning, Oil, and Honey in a Bowl. Add Chicken, turning to coat on all sides. Marinate in refrigerator 15 minutes, or longer for extra flavor. Remove Chicken from marinade, and grill over medium heat for 4 to 6 minutes per side or until done. Discard any leftover marinade.